this is simply an amazing site. I have never been to NYC, and not really sure that I would like it or not. However, it is nice to see some of it through your eyes Robin. I am enjoying this series...I've been to NYC...it's awesome! There is just so much to see...and take pictures of! Great image. Well, Tracy you can come with us next time we go. We will be going back. I really like this one !! The building sure stands out against the blue sky !! 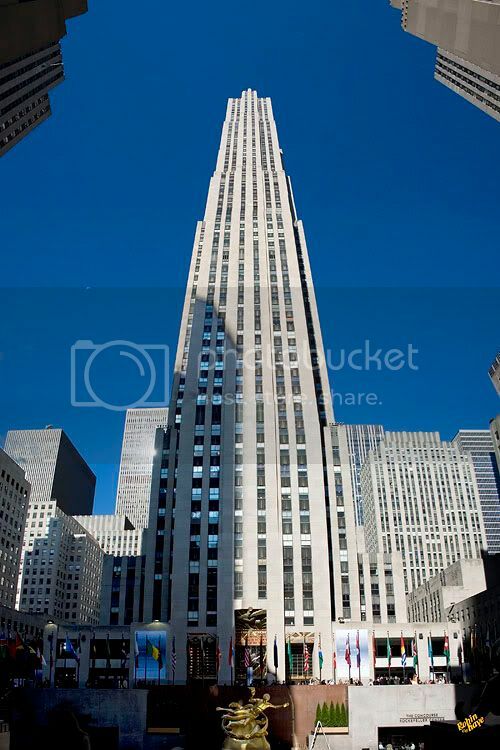 Ahh.. now I get it ....... 30 Rockerfeller Plaza right?? Did you stand out the front of the Today show???? Matt Lauer is such a cutie!! Hell, No! You have to get up early to do that, and I wanted to take pictures not stand in a crowd, hoping to get on TV. There is a new sitcom on NBC called "30 Rock" That is where the title comes from. It is about a sitcom shot in that building. Plus, once a very, very long time ago, Phil Donahue was doing a show, and had the president of Domino's Pizza on the show, and Phil called to order a pizza, and said to deliver it to 30 Rock. Yes, it was there in less than 30 minutes, and Phil gave the delivery guy a $20 tip! Now...wouldn't it have been cool to go to NYC during the hayday of Saturday Night Live!!! Jim Belushi, Bill Murray, Gilda Radner, Chevy Chase, Dan Akaroyd, Eddie Murphy...that would have been so cool! !